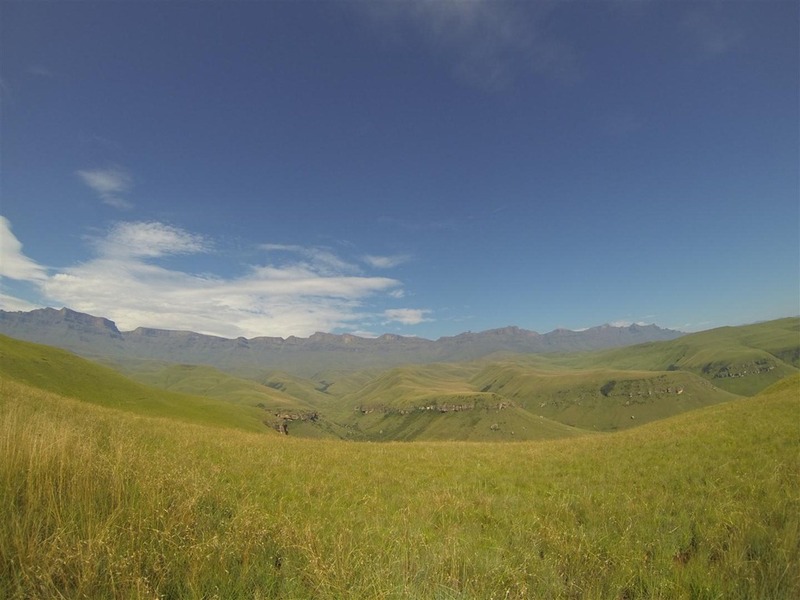 Flying to KZN for the Midmar Mile gave us a good excuse to visit our old playground, the Drakensberg, for a quick visit. 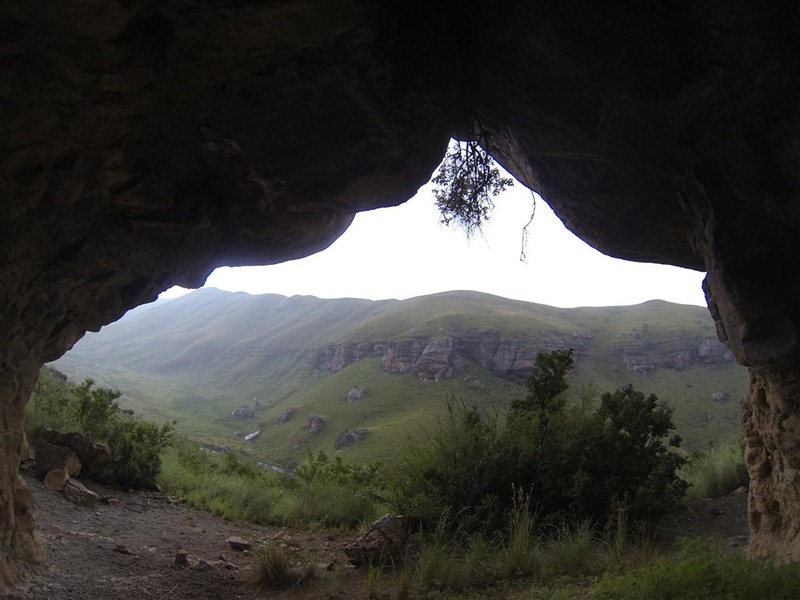 We booked the Sunday and Monday nights at one of our favourite Drakensberg spots – Giant’s Castle. 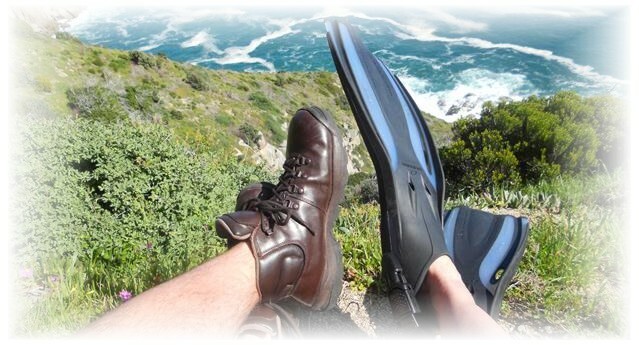 No sooner had we unpacked the car than a good ‘Berg thunderstorm hit the peaks and the Bushman’s River that runs below the camp became a churning mass of brown water. When the sun came out we decided to take our camera on the short circular River Walk. The walk is perhaps 30 minutes long and, sure enough, when we were just about half way – at Rock 75 – another storm started lashing the area. 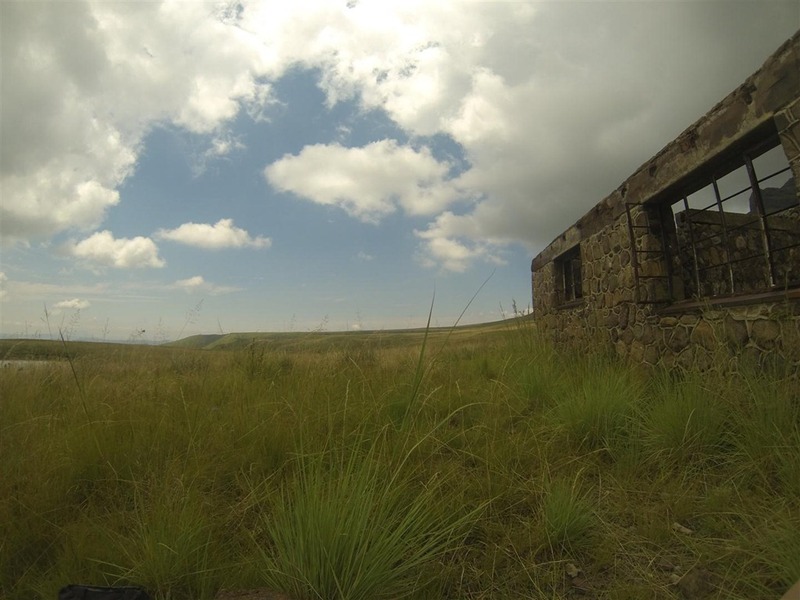 Out of interest, Rock 75 is where Col. Durnford and his 75th Regiment camped from June to September 1873 during the Langalibalele Rebellion. The regiment’s cook carved ‘75’ into the rock. We took a few quick photos of the rushing brown river and jogged back to our cabin pretty smartly. 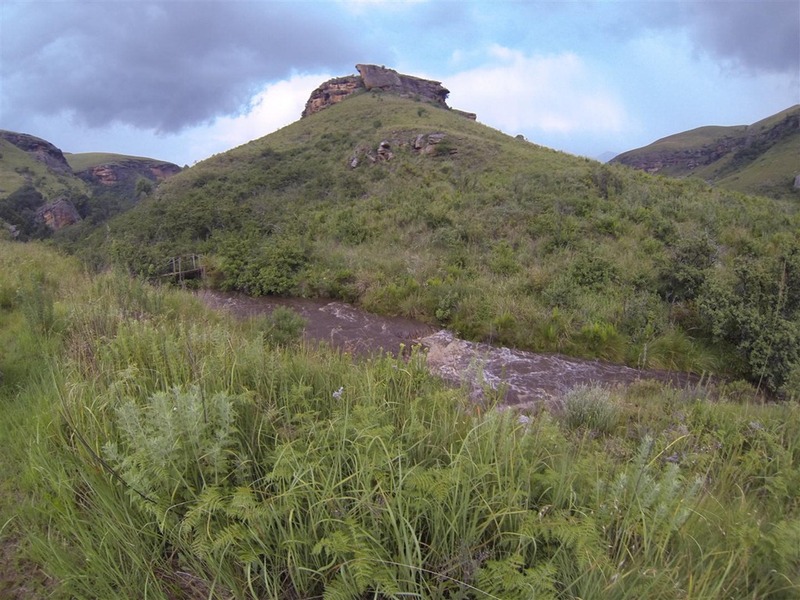 We’d earmarked the Monday for a longish day hike and our choice fell on the circular hike from the camp, up Oribi Ridge to Giant’s Hut, and back via Giant’s Ridge which comes out near the exit of the Main Caves Rock Art Museum. (The museum, by the way, is a must for any first-time visitor). The walk is about 20km (19,5 according to the guidebook but 21 according to our GPS) and should take 7,5 hours. Normally we would be up with those poor early worms that get caught by that darned bird, and on the trail by about 7am to beat the heat and afternoon thunderstorms. But since we were on a Bed ‘n Breakfast package this time we had to wait for the camp’s Izimbali Restaurant to open at 7h30. It was close to 8h30 by the time we started making our way up Oribi Ridge. The morning was as fine as a Drakensberg morning can be – blue sky, green hills, peace and quiet and nothing but wide open space. 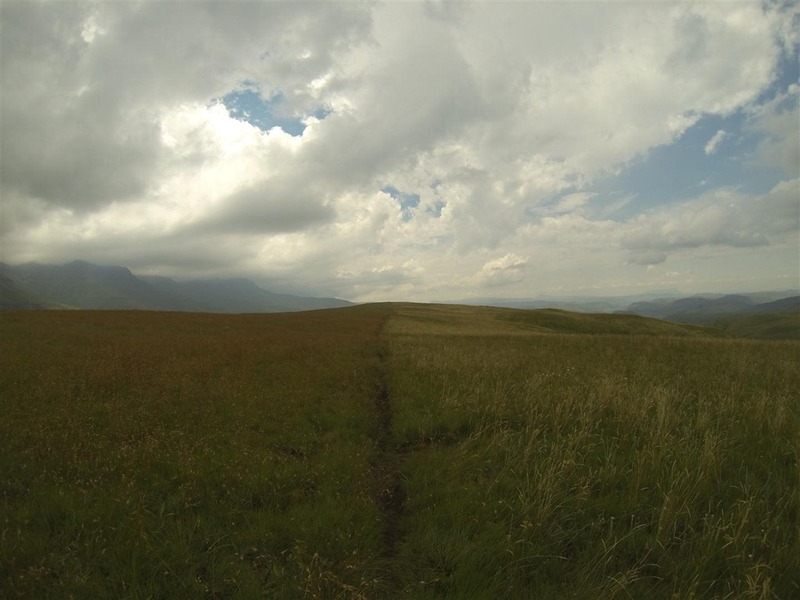 The start is typical of any Drakensberg hike: up. But Oribi Ridge has a good deal too many unnecessary downs thrown in, where you lose a fair portion of hard-won altitude. The thin air at this height (1800m+) doesn’t make hill climbing any easier either, however the endless skyline makes it all worth it. Along the way one passes a picturesque tarn and a vulture hide. Wonder who had the unenviable task of carrying the carrion up here? After about 3 hours we reached the contour path which would take us to Giant’s Hut. A word of caution to those not familiar with ‘Berg hiking: the reasonable man would expect “contour path” to denote a path that follows a contour line. Not so: here it seems to mean a path that climbs up and down as many contours as it can fit in, and the word “path” refers to anything from tussock-hopping to ankle-deep bog. But the peaks on our left were awe inspiring, and we were even treated to a herd of eland jumping over the path and trotting up a slope ahead of us. Eland are some of the largest antelope in the world and were revered by the San. Although easily startled they are by all accounts gentle giants and small numbers have even been successfully domesticated in some countries, including South Africa and Russia. Giant’s Castle Nature Reserve was proclaimed in 1903. We passed what remains of the abode of the first wardens of the newly-proclaimed reserve, Sydney Barnes and Roden Symons. I can’t imagine being more remote from civilisation than these men were. Barnes originally lived in a cave. The nearest neighbour was two days away. Eventually we reached Giant’s Hut, mid-point of our day’s outing. 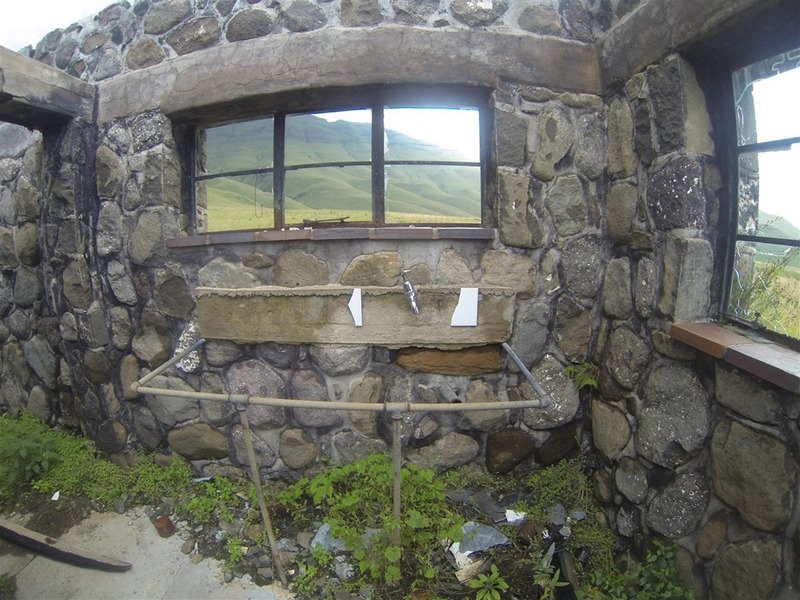 The first thing one notices is the lack of basic amenities: basins, plumbing (there is a forgotten tap, no water though), beds and, umm, windows and roof… The walls are also mostly missing and nature is fast reclaiming the floor. What estate agents would call a Renovator’s Dream. Giant’s Hut was once used as one of several overnight huts along the contour path (Bannerman and Meander Huts being some of the others). It was struck by lightning or destroyed by a veldfire a few years ago. Sad, because in my opinion this hut was probably the most picturesque of all the ‘Berg mountain huts, with the peaks at its back and a lovely tarn in front. I hear that plans are afoot to rebuild the hut at some point in the future. Until then we must listen carefully in the wind as it rustles through the grass, to hear the ghostly laughter and voices of years gone-by. I often don’t have many photos of the return journey of our ‘Berg hikes. The reason for this is that we seem to have to outrun rain, hail and/or thunderstorms on a regular basis. These tend to blow up in the early afternoon and are quite spectacular when you’re 10km from shelter. We donned our rain gear and turned for home. On this hike the way home lay all along the top of Giant’s Ridge. The vegetation to the left of the path differed totally from that on the right, possibly as a result of (controlled) burning. Although we had kept an eye on the dark clouds which had been obscuring the peaks, the actual storm unexpectedly blew up from the valley. Just as were were nicely exposed on the ridge the first thunder started rumbling… and I started running. The path along Giant’s Ridge – note the different colours of the grasses alongside. I have previously mentioned my fear of heights/exposure. I especially don’t like downhills and a normal day would see me gingerly teetering my way down. The ‘down’ often takes me longer than the ‘up’. Significant Other tells me he will never again believe that I’m afraid of heights, because I threw caution completely to the wind (literally) and sprinted down the trail. Thick raindrops started to fall. The flashes of lightning seemed to get closer and closer and after each peal of thunder I would find another gear. (Amazing what you can accomplish with the right incentive!). I was no longer having fun. We knew somewhere ahead we would find a set of shallow caves, but the storm got fiercer and the caves just wouldn’t appear. Finally! The path dipped down through the sandstone layer and we started hunting through the vegetation for the caves. The first proved very shallow and wet. We fought our way back to the path and tried again and there it was: a deeper, larger and dry cave. By now lightning was hitting the ridges above and across from us on a regular basis. The storm was right on top of us. We sat it out on the sharp rocks against the back of the cave. It seemed to last an eternity. Just when you think OK, we haven’t seen a flash for a while now, there would be another one. It was as if the storm was trying to tempt us out of our shelter so it could smite us. But at long last the rain lessened, the sky became a bit lighter and we deemed it safe enough to make dash for it. 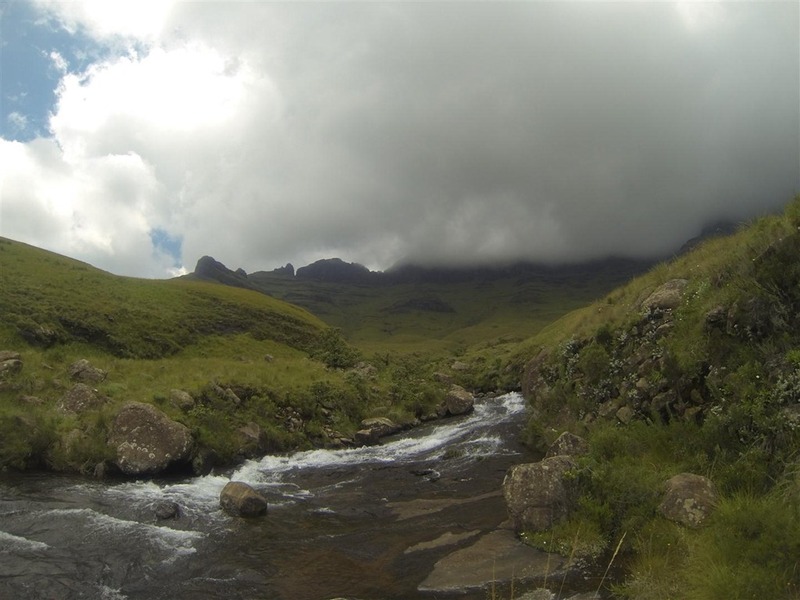 Although we were mentally and physically prepared for the Drakensberg’s notorious mood swings it remains awesome to experience. PS. 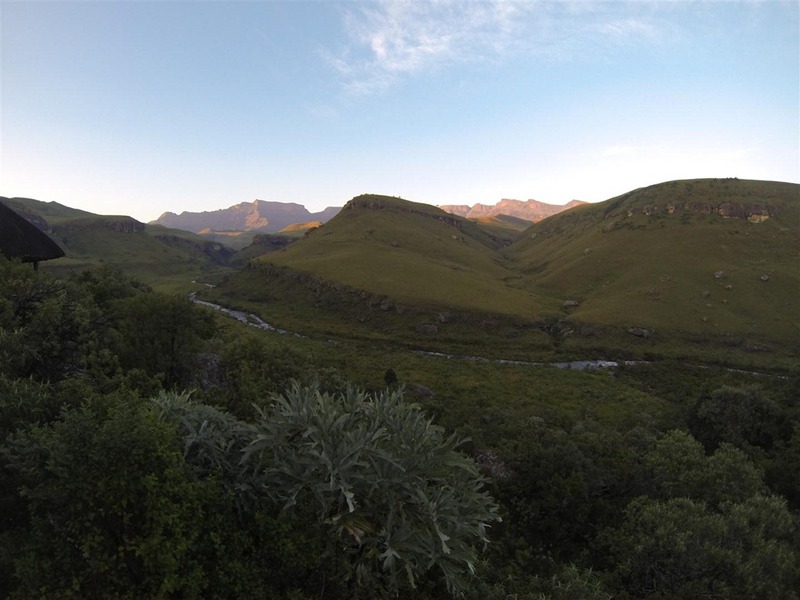 Most of the information about the history of the Drakensberg in this post comes from R.O. Pearse’s classic Barrier of Spears – Drama of the Drakensberg. Well worth reading!